STERLING—It was just talk, but when water is involved, people’s ears perk up. The talk in Sterling was really about water meters—and smart ones at that. During the Sterling town council meeting on Friday March 23, the council invited David Welch, director of Hydro Specialties Company of Draper, to discuss the possible installation in the town of smart meters to keep track of water-collection data and accurate billing. The smart water meters were touted as next-generation options for utilities. As background, when water levels are low in Sterling, the town asks their citizens to conserve. Yet without accurate water information, citizens are never fully confident where they stand with the amount of water that can or cannot be used. In short, it’s hard to know exactly what their water levels are without real-time usage information. In addition, it would be nice to know how much water is actually being wasted prior to the monthly readings. With smart meters, the information would be constantly gathered. This would help customers easily see where water is being wasted. In other words, the smart meters maintain constant vigilance concerning water usage in the whole system. “The smart metering uncovers leaks where water is wasted before it even reaches customers. This can add up to a significant amount,” Welch said. The smart meters would minimize the need for a lot of water-reading equipment such as old-style meters, laptops, city workers to oversee the readings, etc. “It’s scary accurate,” Welch said. In the past, technology worked only for electrical utilities which provided the meters with power. The smart meters run off battery technology and are therefore monitored and inspected regularly. In Sterling, 32 meters aren’t being used right now, and checking on them monthly is an expense in itself. “Some of those meters are off. Like the one at Lily’s, a few vacant houses, and there are a couple in fields out of the city limits that are checked monthly,” Councilwoman Yvonne Larsen said. The town agreed to put locks on those meters. Hydro Specialties Company is planning to provide Sterling with several options. This will enable the town to consider the financial and other costs involved in the potential switch to smart meters, along with a propagation study which proves the change is a sound financial investment. The meter is engineered to deliver superior performance, low maintenance and durability. The company anticipates a strong market for cellular-enabled smart meters in the coming years for several reasons. First, cellular smart water meters are essentially plug-and-play devices that require no additional network infrastructure, and the information technology network communications elements used in the water meters can also be used for power plants and other utilities. With Sterling’s challenging terrain, which often makes communication difficult, using the existing cellular infrastructure for smart meters is very attractive. Also, with the rising cost of water, which is a scarcity, citizens need an improved readout of their consumption, not to mention the data allows immediate notification for possible leaks. 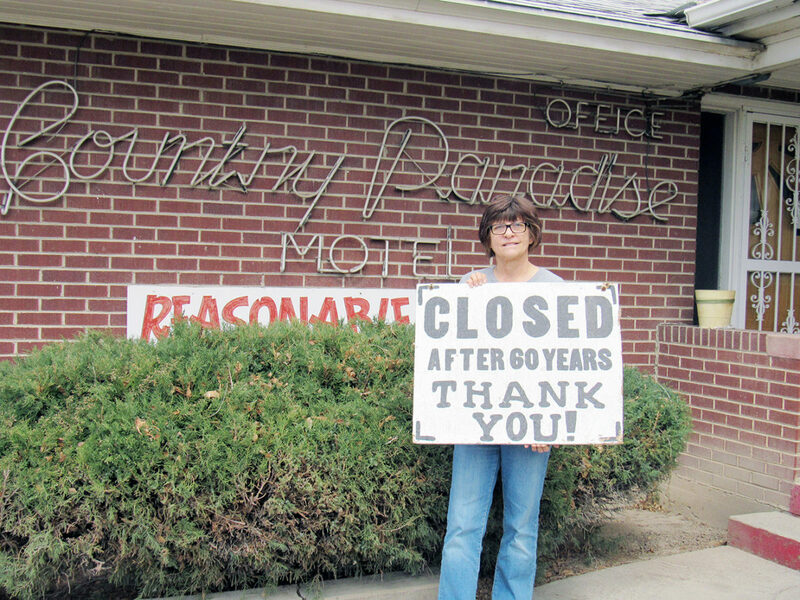 Janet Haight (right), daughter of proprietors Gayle and Joye Hanson, holds the sign that went up in 2014 announcing closure of the motel. 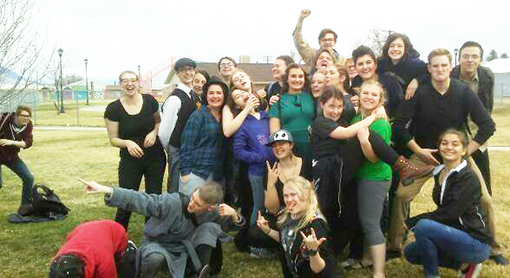 Manti High School’s drama program took first place in region competition. The school’s drama students have won region seven times in a row. A change in state student testing is music to the ears of some local educators and administrators. On March 16, the Utah State Board of Education announced that beginning next year, ninth and 10th graders will take the ACT Aspire test instead of the SAGE (Student Assessment of Growth and Excellence) test. Younger grades will still take the SAGE test. North Sanpete High School has already been using ACT Aspire to help students prepare for college. According to those policies, SAGE testing is not mandatory, and with parents’ permission, students can opt out. Test results also cannot be counted toward a student’s grade. Ray said students often didn’t take the test very seriously, and they were getting whatever students felt like doing that day, not their best work. SAGE was originally intended as an assessment for third through 11th graders. In 2016, lawmakers passed legislation allowing school districts a choice on whether to have 11th graders take the SAGE test. This year, both school districts passed on having juniors, who already have to take a state-mandated ACT test, do so. (Larsen said he had not heard from leadership about the change and so was reluctant to comment officially). Larsen said when SAGE, a Utah-developed test, was introduced by the Department of Education, its objective was to make it more aligned with international testing of students. Initially, American and Utah students did not seem to measure up to their peers in other countries, he said. “Once 7 to 10 percent of kids are opting out, the validity of the test goes away,” he added. Larsen said while the emphasis on preparing for college is good, it is important that students who choose alternatives such as vocational college or training not be overlooked. “We don’t want the emphasis to be solely on preparing kids for four-year universities. We want to push our kids to get everything out of school they can,” he said. Going forward, younger grades will still take a SAGE-like test, according to Darin Nielsen, Utah assistant superintendent of student learning. The state recently rebid the contract, and it has gone to a new vendor, Questar (not to be confused with the former utility company). The test’s core was developed by Utah educators and is owned by the state, but with a new vendor, there will be a new portal or delivery system for the test. Additionally, there will probably be a name change, Nielsen said. Coming up on Friday, April 6, is the Junior Genius Fair from 8:30-10 a.m. The PTA is looking for someone who is willing to serve as PTA president next year. Interested parties should contact Sandra Summers. Ephraim Middle School Symphonic Band performs at Utah Music Educators festival. 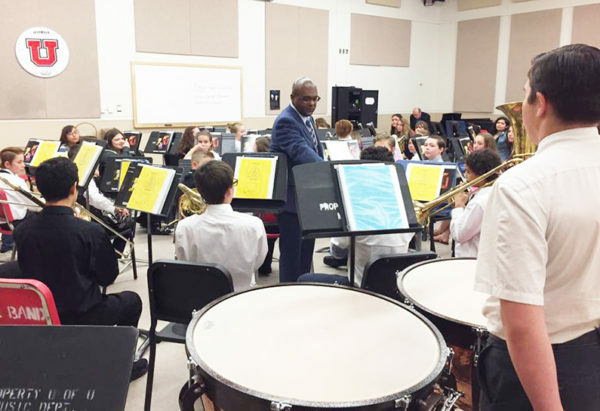 The Ephraim Middle School Symphonic Band participated in the 2018 State Utah Music Educators Association Junior High Concert Band Festival last Friday, March 23, in the Libby Gardner Concert Hall at the University of Utah. The festival took place over two days, Thursday and Friday. In order to be invited to participate in the festival, each band must submit a recording of the required chorale and a piece selected by the director that best represents the strengths of the group. The submissions are then evaluated by a group of judges, which narrow the 30 bands down to 15 which are classified as Sweepstakes bands and play on Friday. This year was Ephraim Middle’s second year in the Sweepstakes category. Band members played well, did great with their sight-reading piece and enjoyed a music clinic with Robert T. Herrings III. 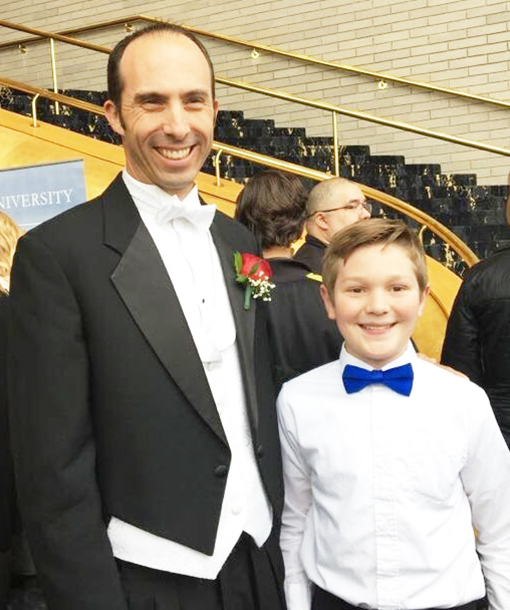 Nathan Bigelow, son of Russell and Amie Bigelow of Manti and an Ephraim Middle School student, was recently selected by audition for the All State Jr. High Band. The band was under the direction of Jermie Arnold of California State University, Long Beach. They performed in Abravanel Hall in Salt Lake City on Jan. 20. 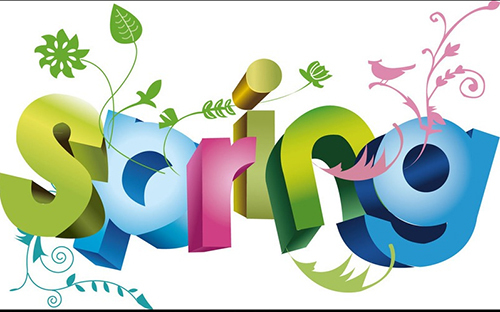 Next week will be student body elections with an assembly on Wednesday, April 4. 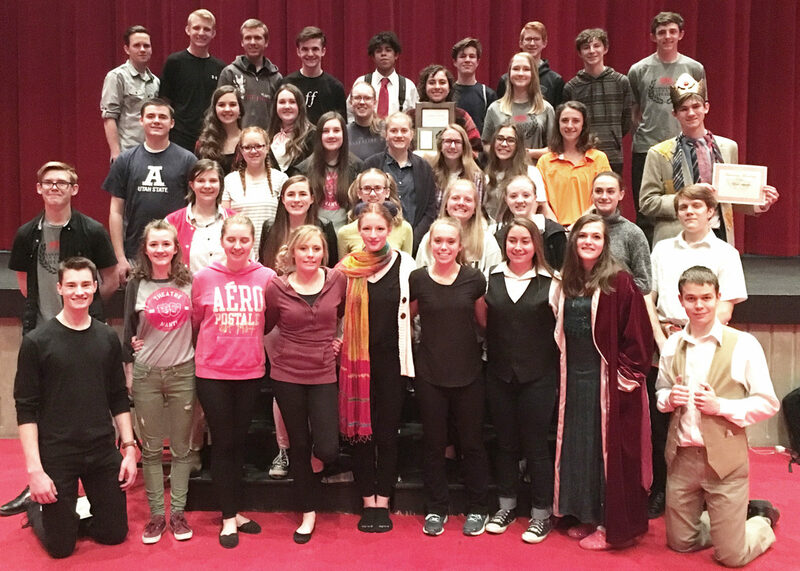 North Sanpete High School took second overall at the region drama competition at Manti High School last Friday and Saturday, March 23-24. 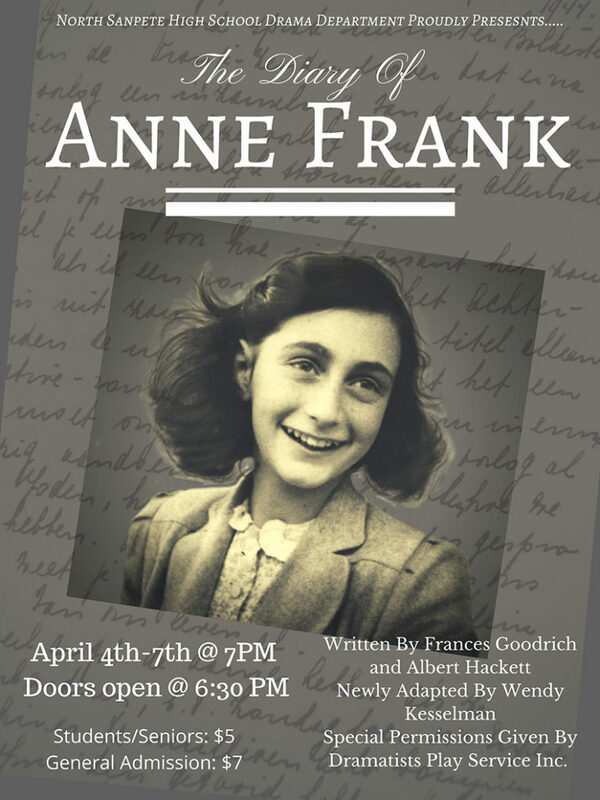 Keagan Mitchell was named Best Actor for his portrayal of Otto Frank in the school’s one-act version of “The Diary of Anne Frank.” Taking first place in Classical Scenes were North Sanpete’s Emily Hill and Brynne Lamb. Second place in Contemporary Scenes went to Aubrey White and Nettie Knudsen and third went to Alicia Perry and Kylee Davis. The cheer team recently hosted Red and White Night on Thursday, March 22, with performances by the cheer team, Snow College Badgerettes, Britts Just Dance and Airborne Gymnastics and Cheer. The team from Ephraim Middle School which built an electric car and raced it at the state competition last year (L-R): Ashton Hirschi, Kaulin Nielsen, Mathew Olsen, Keegan Merrill and Kaden Owens (in car). their way to victory again? 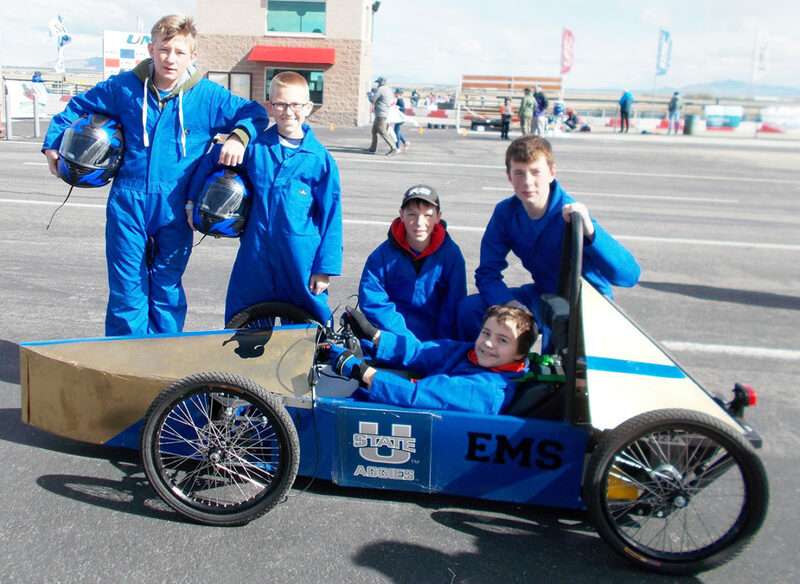 Students at several local schools are getting ready for the annual Utah Greenpower Exhibition which will be held at the Utah Motorsports Campus in Tooele on April 26. Last year, Sanpete schools swept the top four spots, showing the Green Power program, where students build and race a single-seat, electric car, has been very popular in the county. Twenty schools are participating this year. At the race, the qualifying heat lasts about 45 minutes and then the main heat goes for around 90 minutes. Winners are determined by how many continuous laps a car completes. At least three drivers take turns on the course. The car that has the fastest lap gets extra points. In addition to racing the car, participants must make a video introducing themselves and their role in building the Green Power car. “The kids have to learn the best speed to race at to be the most efficient,” Tiffanie Baker, Ephraim Middle School’s GEAR UP coordinator, said. Ephraim Middle School was last year’s fourth-place winner (tying with Uintah and Clearfield high schools). Students at Ephraim Middle School are working on making modifications to last year’s car to improve their performance this year. They are also giving the car a fresh coat of paint. Utah State University sponsors the Green Power program to inspire students to go into the engineering field. At Ephraim Middle School, the number of students involved in the Green Power program varies but is usually a core group of about six. About half participated last year and are taking what they learned to improve their car. “They think it’s great that they get to drive a go-cart around the parking lot,” Baker said. “The program is very student driven,” whether her pun was intended or not. At all of the schools, teachers, generally Career Technical Education (CTE) teachers, are paid an hourly rate by GEAR UP to run the program after school. The groups all purchased kits and built the cars from there. Gunnison Valley Middle School has about 11 students in the program, about half of whom participated last year, Samantha Dyreng, GEAR UP coordinator, said. Last year was the first year GEAR UP offered the program at the school. At the state competition, despite a tire that picked up a screw in the preliminary race which resulted in a flat tire, Gunnison Middle School took first place. Last year’s Manti High School car took third place at state but went to international competition (as a result of a first-place state finish the previous year) against 24 other teams in England in May and competed on the Grand Prix road circuit at Indianapolis Motor Speedway. The Manti team took fourth place overall despite major electrical problems which caused the motor to completely fail during the preliminary heat. The team had a strong second heat and was able to use its score from that heat to achieve the fourth-place finish. Four local high school students will attend a four-day conference in Pennsylvania next month. Three Gunnison Valley High School juniors—Tiandra Taylor, Teersa Payne and Ruth Lyons, along with Manti High junior Edison Cluff, will shortly have the opportunity to attend the April 12-15 Spirit of America Youth Leadership Conference at Freedoms Foundation in Valley Forge, Penn. To be considered for the conference, students must submit a detailed application and an essay and be interviewed by a selection committee. “It’s pretty unusual for us to choose three students from one school, but we were just so impressed with the students from Gunnison,” committee chair Dennis Ward said. Sponsored by the Freedoms Foundation, the conference brings together students from across the nation to study the American political process, citizenship, democracy, the free enterprise system and the judicial system. “It’s absolutely invaluable for the kids to go because of their exposure to the roots of American history,” Utah chapter president Dennis Randall said. Edison said he is fascinated with the political process and wants to learn how to utilize it to help others. Tiana said she is looking forward to learning more about the history of our nation. Along with lectures and reenactments, students will participate in a mock Congress where they will debate hot topic issues like gun control and national security. At the conferences, participants are intentionally not housed with the group they travel with so they are exposed to a diverse mix of youth. This is something, Edison, who moved to Manti from Texas just over a year ago, is particularly looking forward to. Along with conference tours of Valley Forge and the Medal of Honor Grove, the group will also get to tour Independence Hall, homes of George Washington and Betsy Ross and the new Museum of the American Revolution before heading home to Utah. The Utah chapter of the Freedoms Foundation pays $900 of the $1,300 cost for each student’s attendance at the conference and the airfare. The students are asked to pay the rest and are encouraged to obtain sponsors. Edison’s grandmother and aunt agreed to sponsor him if he would perform acts of service around his neighborhood and community. “It was a bit different being paid to do service,” said Edison, who usually serves without charge. Tiandra said her parents paid half of her costs, and she paid the rest. Randall said the Utah chapter is blessed to have several wealthy donors who help fund the program and volunteers who are willing to visit schools to share the program with students. “There’s a real passion for the principles of patriotism and the values of the Freedoms Foundation, and the reality that this country is made up of all kinds of people and states yet we’re all in it together,” he said. The Freedoms Foundation also sponsors a weeklong summer program for history teachers. All costs are covered by the local chapters. More information can be found at freedomsfoundation.org. RANGELY, Colo.—The Lady Badgers from Snow College got back on the winning track by sweeping a three-game softball series against Colorado Northwestern College (CNCC) in Rangely, Colo. Snow dominated the Spartans, winning by scores of 4-0, 13-3 and 18-4. The fourth game of the series scheduled for late on Friday, March 23, was rained out. The series opener on Friday, March 23, was a pitching gem from Lady Badger sophomore Sydni Sorensen, who shut out CNCC on two hits while walking just two and striking out eight. The Lady Badgers staked Sorensen to a three-run lead in the top of the first inning with centerfielder Sarah Sandberg’s two-run double doing the damage. Syd Wilson and Haylie Smith also doubled for the Lady Badgers in the game. Only one time did the Spartans have more than one runner reach base in an inning against Sorensen, and only one Spartan runner reached third base safely in the game. In Saturday’s opener on March 24, the Lady Badgers exploded for five runs in the second inning and four runs in the sixth as they overwhelmed the Spartans 13-3. Snow pounded out 12 hits and took advantage of nine walks issued to them from the Spartans’ pitchers. Lefty Riley Cleverly took the complete game win for Snow, giving up three runs on five hits and striking out six. Wilson was three for four with a double for Snow with Smith, Dakota Hare and Torri Bills each getting two hits. Hare drove in four runs, while Wilson and Bills each drove in two. Brooke Brown also drove in two runs on a solo homer and a sacrifice fly. Brown led the way in Saturday’s second game going five for six at the plate with a pair of doubles and three RBI as the Lady Badgers stormed to an 18-4 win. Bills added four hits of her own and scored four times. Sarah Sandberg had a pair of hits, including a third-inning grand slam, and fellow outfielder Jaden Smith also drove in four runs on a pair of hits, including a three-run homer. Freshman Sadie Clark was the winning pitcher for Snow, giving up four runs with four strikeouts before giving way to Sorensen for relief work in the fifth inning. Sorensen shut out the Spartans the rest of the way while striking out three. The Lady Badgers are now 6-9 in the Scenic West Athletic Conference and will host 6-10 Utah State University–Eastern in a four-game series this weekend beginning at 1 p.m. tomorrow. About 40 registered Republicans attended the Mt. Pleasant City caucus Tuesday night to elect county and state delegates. MT. PLEASANT—A plan to create a new position in city government met ome skepticism and criticism at last week’s Mt Pleasant City Council meeting. Councilman Kevin Stallings presented the plan at the council meeting on Tuesday, March 13. The plan, Stallings said, is for the city to hire a city administrator to supervise planning and zoning. Mayor Sandra Bigler said she had hoped the council would delay a decision on the position until the end of the fiscal year, especially now that the city needs to hire a new recorder. Stallings said for 50 years, the city of Mt. Pleasant has had between 2,000 and 3,000 people. During those years, the city has had two departments—the power department and the public works department. The public works department is responsible for all city property, construction, maintenance and repair. The power department is responsible for all electrical works within the city. Over the last four years, responsibilities faced by those departments has increased significantly. Stallings and the council have been thinking for some time on how to better handle those responsibilities and make the city more efficient. Their plan is to create a new position, which would be responsible for more of the planning and zoning issues. The council’s plan would also create a new department—roads and water—so city personnel could be utilized more efficiently. Randy Wooten, a concerned citizen, said, “This [plan] is full of holes.” Citing his previous Army service, Wooten asserted that the city should not be thinking of hiring new people but should be figuring out how to get the job done with the people it already has. If new people need to be hired, it should be “boots on the ground” personnel instead of a new supervisor. Sam Draper, public works director for the city, said that how the plan was explained made him feel “disrespected,” and he was already working on ways to make his department more efficient. Shane Ward, director of the power department, also spoke in Draper’s defense. He said the issues plaguing the city revolve around planning and zoning. Ward argued for having the new recorder supervise some of those issues. Meanwhile, Draper can have his foremen cover particular areas. Stallings read the job description the council had drawn up for the new position. The applicant would have at least a bachelor’s degree, 10 years of related experience in construction and planning and zoning, along with people skills to match. Upon hearing the job description, the audience spontaneously expressed surprise and shock at the description, with one audience member saying they thought that position would merit a salary of $250,000. In response, Councilman Keith Collier, who works professionally for the city of Draper, said the city planner for Draper only earns $110,000 per year. He questioned whether hiring a new supervisor might eliminate another position or whether it would necessitate raising taxes. Officer Nate Taylor of the Mt. Pleasant Police Department spoke out against the council’s plan by saying, “We’re maxed out” at the police department. He described the police department as a “small-town department that takes big city calls” and said it’s a big mistake to allocate resources without considering other departments. Stallings responded by reminding Taylor and the audience Mt. Pleasant raised police department salaries last year in order to retain the current officers and keep them from taking other jobs. Stallings added that Mt. Pleasant needed a “supervisory general.” He also said the new position would be paid the same as other supervisory positions within the city, with a yearly salary of about $70,000, with benefits coming to approximately $10,000-$20,000. Stalling also said the new recorder position would be able to take over the financial director’s responsibilities, which would allow the city to reallocate the monies spent for that position. Former councilman Jeff McDonald addressed the council and asserted the council’s plan amounted to a change of form of city government. He quoted the Human Resources Manual of the Utah League of Cities and Towns and said when a city decides to add a city manager, it has to get final approval by vote from the citizens. Monte Bona, Community Development and Renewal Agency executive chairman, clarified what the council wanted to do. He pointed out the council wanted to hire a city administrator, not a city manager, and the city administrator would report directly to the mayor. Bona agreed with McDonald that adding a city manager (who would report to the city government as a whole and not just the mayor) would be a change in form of government, which this council did not have the authority to do. However, a city administrator would be appointed by the mayor and presented to the council for approval, just like the city treasurer or police chief. Diane Blackham, wife of former mayor Blackham, accused the council of a “history of bad behavior,” which had been directed against her husband while he was in office and then against Banks, against Draper and now against Bigler. The audience responded by a sustained applause. Bigler took control of the meeting, asking the council if it had specific figures for the budget items on the agenda. When they said they didn’t, she adjourned the meeting. 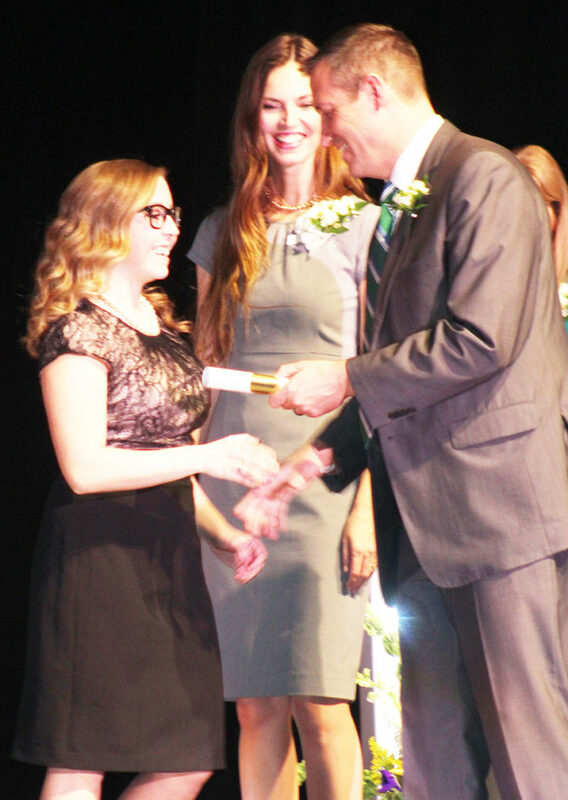 But when Maria Shilaos of KSL Radio read profiles of regional winners during the Central Utah awards ceremony last Thursday, March 15, at Richfield High School, it was obvious the talent and drive of Sterling Scholars stretches far beyond their specific subject areas. Breanna Hedelius of Manti is named the regional Sterling Scholar in math at an awards ceremony at Richfield High School. Congratulating her are Dallas and Janelle Overly of Gunnison, co-chairs of the program in Central Utah. Take Breanna Hedelius of Manti High School, the Sterling Scholar in math. At age 4, she learned the square root of 144. She’s currently taking calculus. And she got 33 out of 36 possible on the math section of the ACT, which put her in the top 2 percent of test takers nationwide. But Breanna, the daughter of Eric and Merilyn Hedelius of Manti, is much more than a math brain. She’s a student body officer at Manti High, serves on the Manti Youth City Council as mayor and is the reigning Miss Manti. And she played a key role in collecting 7,460 books for Kenya. Thirteen high schools participated in the Central Region Sterling Scholar competition this year. A number of small schools had contestants in only a few categories. Nonetheless, it was notable that five of the 15 winners, or one-third, were from two Sanpete County schools. Manti High ended up with three winners, while North Sanpete had two. Besides naming a winner, Sterling Scholar judges tapped two runners-up in each of the 15 categories, or 30 runners-up total. Twelve of the runners up, or 40 percent, were from the three public high schools in Sanpete County. 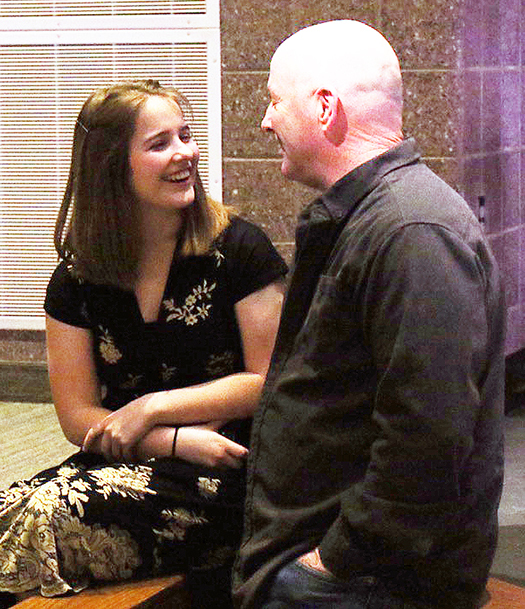 Hannah Ostraff of North Sanpete High talks with her father, Joe Ostraff, before the Sterling Scholar awards ceremony. Later, she was named winner in the visual arts category. Her father is also an artist. Other top winners from the county were like Breanna. Their profiles, as read by Shilaos, showed a broad range of accomplishments. Kjerstin Birch, daughter of Troy and Lori Birch of Ephraim, who attends Manti High, was named Sterling Scholar in business and marketing. She has been an officer in Future Business Leaders of America (FBLA) at Manti for the past three years and was selected as a Utah delegate to the national FBLA convention. She participated in a three-day entrepreneurship competition at the Leonardo museum in Salt Lake City. But besides those business-related activities, she played volleyball and basketball for Manti, is mayor on the Ephraim Youth City Council, has a 4.0 grade-point average and had a composite score of 30 on the ACT, which puts her in the top 5 percent of the nation. 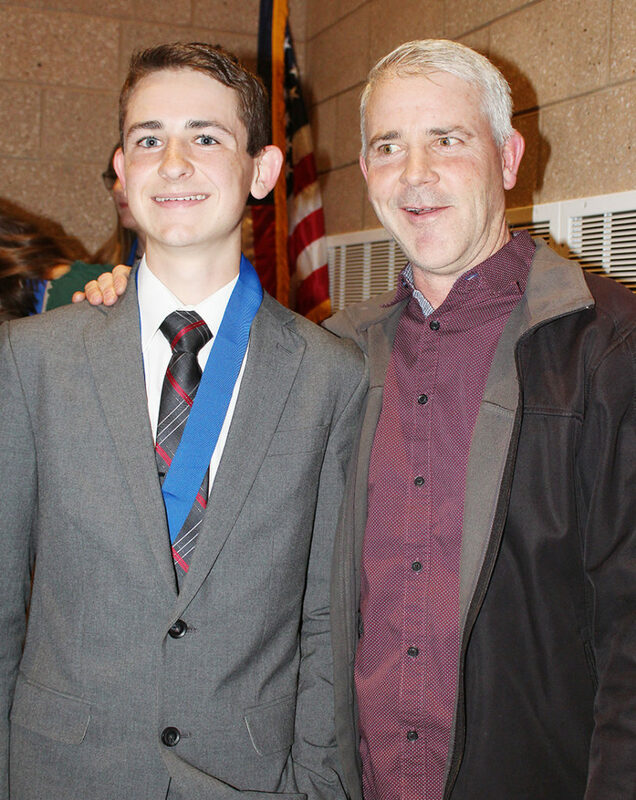 Trevor Olson of North Sanpete High with his proud dad, Glen Olson, after Trevor was chosen as Sterling Scholar in music. But she says the highlight of her life was building housing in Merida, Mexico, for neglected and abandoned elderly women. The regional winner in music was Trevor Olson, a North Sanpete High School student and the son of Glen and Ann Jeanette Olson of Moroni. A saxophone player, he has participated in state competitions in band, jazz band and marching band. Last year, he was the drum major of the marching band. He has also participated in community music ensembles. But aside from his music, he helped found the chess and math clubs at North Sanpete, has a 3.99 grade-point average and scored 29 on the ACT, which put him in the top 8 percent. 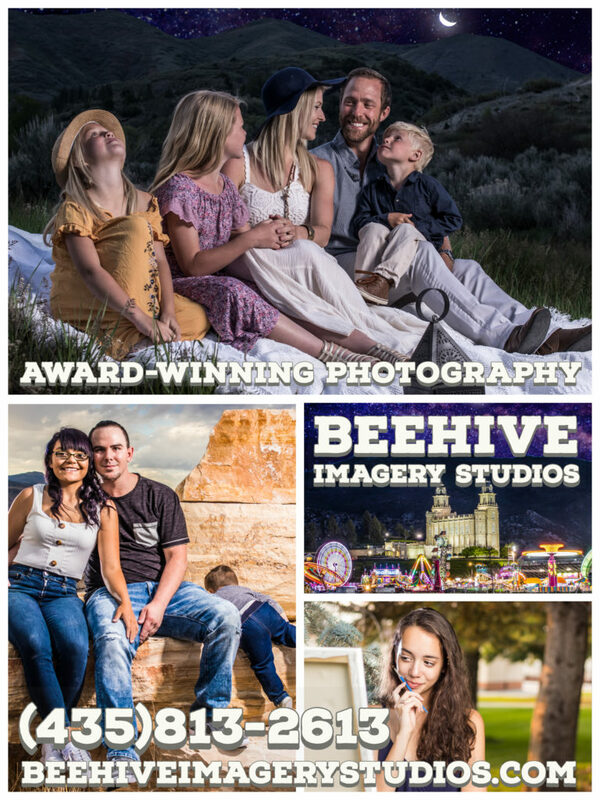 Another North Sanpete High student, Hannah Ostraff, the daughter of Joe and Melinda Ostraff of Fairview, was the regional winner in visual arts. She has participated in four international art shows, two national shows and several state exhibitions. She organized an art show involving six schools in New Zealand and another that drew from schools in Ireland. Besides her art activities, she played tennis all four years in high school and was a state semi-finalist her senior year. She is on the staff of the North Sanpete school newspaper, has a 3.9 GPA and has organized many community projects, including one with a senior citizen center. The fifth Sanpete County winner was Killick Mickelson, a Manti High student and son of Ryan and Jennie Mickelson of Manti. He was named Sterling Scholar in computer and information technology. Killick has attended computer camps at Southern Utah University and Snow College, he took charge of filming Manti High football games and is a team captain for the wrestling team specifically in charge of media. 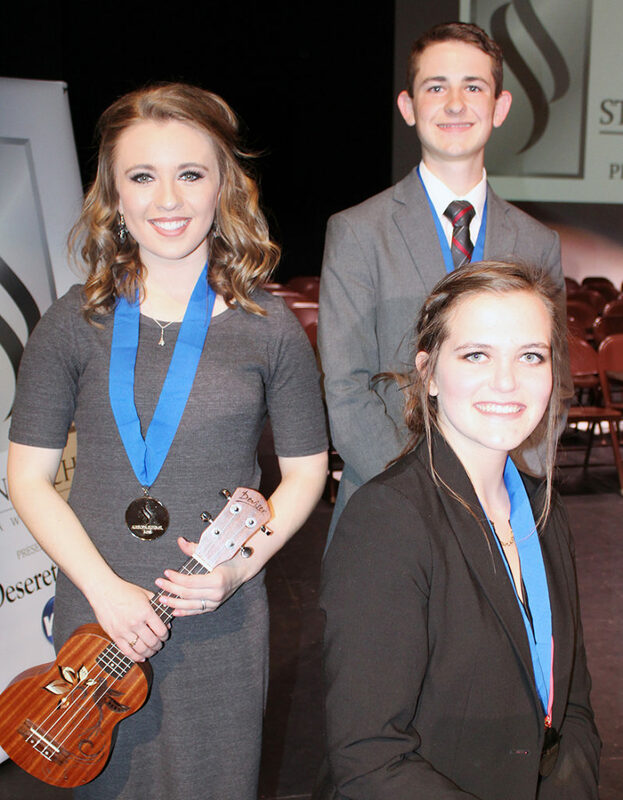 Sanpete County stood out in music at the Sterling Scholar awards program last week. The winner and both runners-up were from the county. Seated at the piano is runner-up Emily Frischknecht of Manti High. Behind her are runner-up Carolyn Donaldson of Gunnison Valley High and winner Trevor Olson of North Sanpete High. He’s also involved in civic and community activities. He attended Boys State, observed at the Utah Legislature, was a member of the Child Abuse Prevention Team, was on Manti Youth City Council and coached a junior wrestling team for three years. He scored 32 on the ACT, which put him in the top 2 percent. A traditional part of the awards program is a Sterling Scholar from the previous year returning to present a tribute to parents and teachers who helped the students on stage become Sterling Scholar finalists. This year’s tribute was presented by Jennifer Boekweg of Mt. Pleasant, the 2017 winner in speech and drama, and a graduate of North Sanpete High School. Boekweg said teachers from kindergarten through 12th grade had nurtured her and other Sterling Scholars. Often, she said, students started to love the subjects in which they are being honored that night after they were reached and inspired by teachers in those subjects. The Sterling Scholar program relies not only on faculty advisors at the high schools but on community volunteers. Dallas and Janelle Overly of Gunnison, outgoing co-chairs of the Central Utah program, received service awards. And Andy Peterson was recognized for serving for seven years as Sterling Scholar faculty advisor at Gunnison Valley High School. 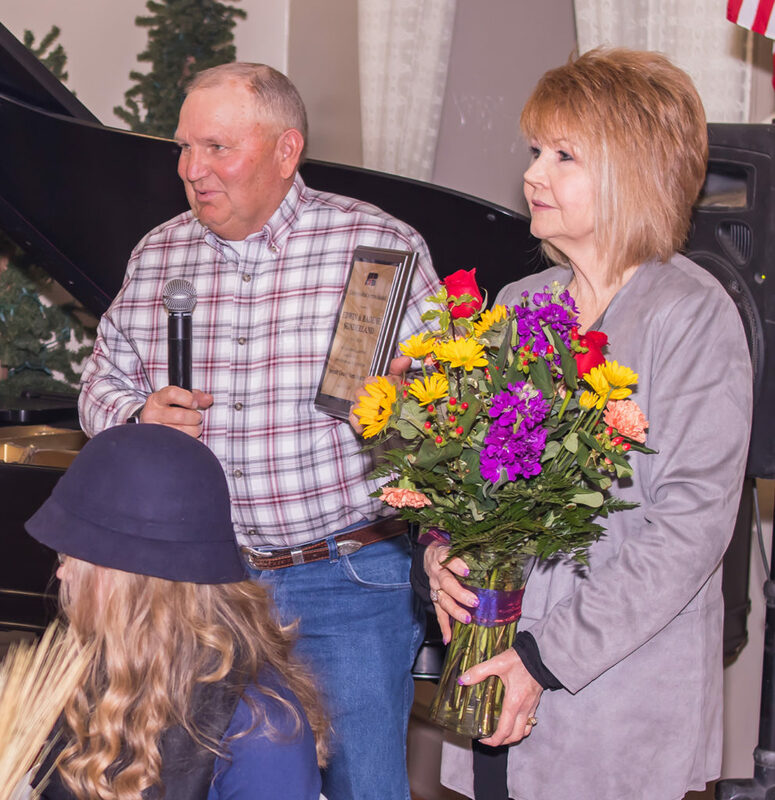 Edwin (left) and Radene Sunderland of Chester, were honored by the Sanpete County Farm Bureau with the Distinguished Service Award after more than 45 years of involvement with the organization. During that time, Edwin served on its board of directors, as its president and with the state-level board of directors. EPHRAIM—It isn’t hard to see why the Sanpete County Farm Bureau chose this year’s recipients of the organization’s Distinguished Service Award at their annual banquet last week. The honorees are a couple who have been on the cutting edge of farming technology and making a positive impact on Sanpete’s farming community since they moved here in the 1980s. Edwin Sunderland of Chester and his wife, Radene, were presented the award in front of a full room of onlookers during the Farm Bureau banquet that was held at the Ephraim Co-op on Thursday, March 15. The Sunderlands have both been involved in the Farm Bureau since they were married. Edwin served for nearly 45 years on the bureau’s county board of directors—with a stint as president—and more than 10 years on the state board of directors. Radene has been active alongside him in support and has made many friends with other Farm Bureau wives. When the whole Sunderland family uprooted from their former home in Lehi in 1980, they brought with them forward-thinking farming. They have six children and 17 grandchildren, many of whom have worked alongside Edwin on the farm. Computer-aided recordkeeping of the entire Sunderland Dairy operation—which Edwin ran alongside his brother Scott for many years, proactive conservation techniques and heavy involvement with the local agriculture community cemented Edwin’s place in the forefront of Sanpete’s ag pack. Edwin has served as chairman of the Sanpete County Water Conservancy Board for 21 years and is currently making a bid for county commissioner. Sunderland Dairy, which was one of Sanpete’s largest farming operations for many years, became the first farm in Utah to sign with the Conservation Security Progam (CSP), which was administered by the Natural Resource Conservation Service in 2005. The then-brand-new program rewarded farming operations that maintained good stewardship of soil, water, air, energy and animal and plant life on their farms. Sunderland Dairy not only qualified for the CSP but qualified under its strictest and most rewarding guidelines: Tier 3, which required active and proactive conservation efforts in nearly every aspect of the operation. The Sunderlands have also played an active role in sharing their farming techniques with other Central Utah farming operations. That fact, and years of business in Central Utah’s farming community, have earned them plenty of friends. Brent Johnson of United Soil Science, a Salina-based fertilizer and soil-testing company, said from working with Edwin over the years, he considered the Sunderlands “really good people” and said the Farm Bureau made a good call on choosing him for the award. John Eliason, longtime Farm Bureau Financial Services agent, agrees with Johnson, saying he too thought they made a good pick with their choice of recipient this year. 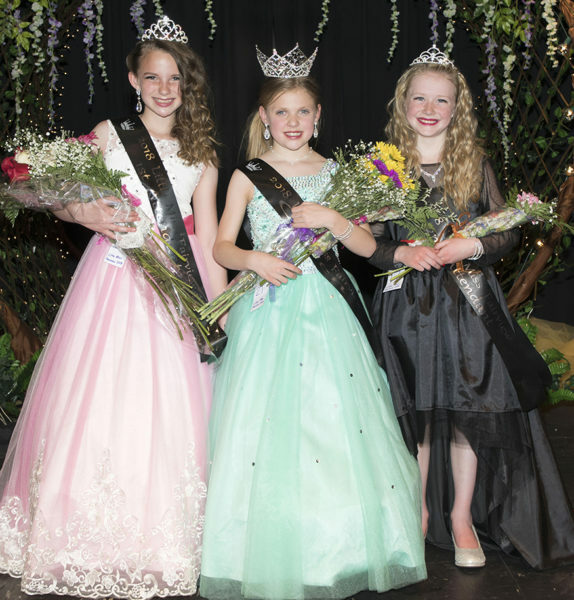 FAIRVIEW—Of the 29 young girls who participated in Little Miss Fairview 2018, 16 were crowned as royalty in five age categories. 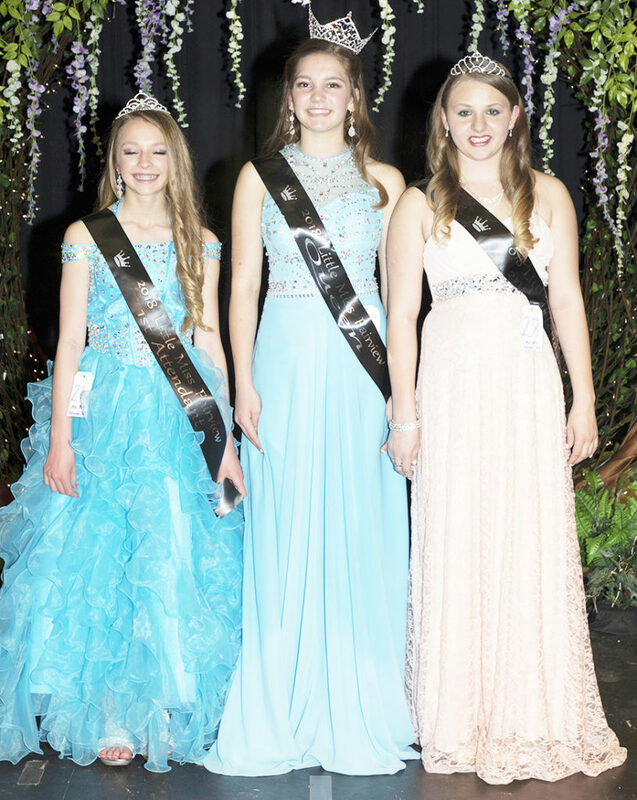 Little Miss Fairview royalty for ages 13-14 (L-R): 1st Attendant Taysha Olson, Queen Raycee Fuel and 2nd Attendant Emily Bills. 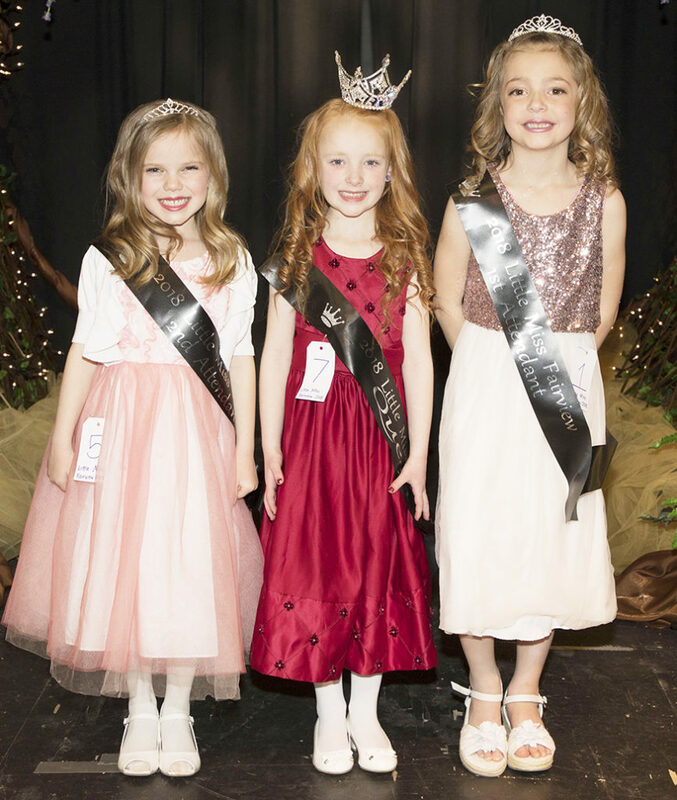 Girls ages of 4-14 competed in the pageant, which took place at the Peterson Dance Hall in Fairview on Saturday, March 10. The competition included personal interview, casual wear and party dress, along with talent competition for girls 7-14 years old. This year’s royalty for ages 4-6 are Queen Zana Lucas, daughter of Tad and Crystal Lucas; 1st Attendant Kali Madsen, daughter of Nick and Natalie Madsen; and 2nd attendant Penelope Cox, daughter of Kenny and Brook Cox. For ages 7-8, the royalty are Queen Swazey Bills, daughter of Brady and Dustylynn Bills; 1st Attendant Kenlee Sorensen, daughter of Garrett and Shandi Sorensen; and 2nd Attendant Jacey Gleave, daughter of Lloyd and Katie Gleave. 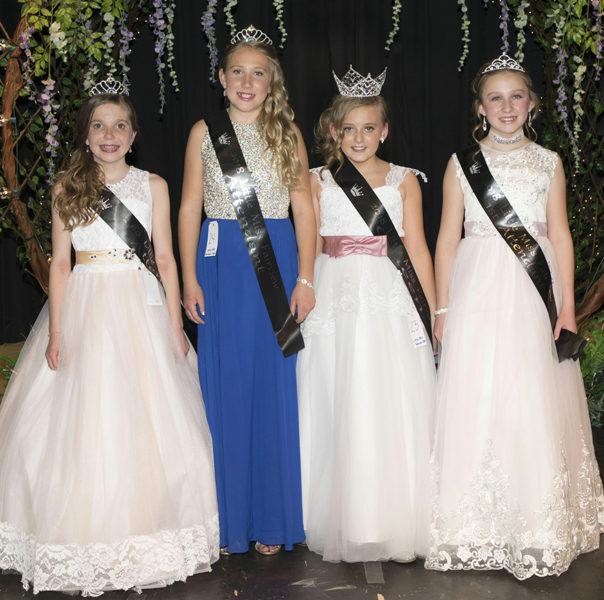 Little Miss Fairview royalty for ages 11-12 (L-R): 2nd Attendants Alivia Madsen and Addie Clayton, Queen Brecklyn Thompson and 1st Attendant Kambrielle Grasteit. For ages 9-10, the royalty are Queen Kaylee Curtis, daughter of Sam and Marcy Curtis; 1st Attendant Shae Rawlinson, daughter of Sean and Shaunna Rawlinson; and 2nd Attendant Ashlyn Williams, daughter of Keith and Heidi Williams. For ages 11-12, the royalty are Queen Brecklyn Thompson, daughter of Shayne and Natalie Thompson; 1st Attendant Kambrielle Grasteit, daughter of Thor and Kristen Grasteit; and 2nd Attendants are Addie Clayton, daughter of Rich and Carol Clayton, and Alivia Madsen, daughter of Nick and Natalie Madsen. Little Miss Fairview royalty for ages 9-10 (L-R): 1st Attendant Shae Rawlinson, Queen Kaylee Curtis and 2nd Attendant Ashlyn Williams. For ages 13-14, this year’s royalty are Queen Raycee Fuel, daughter of Ben and Mandi Fuel and Mike and Melissa Hardy; 1st Attendant Taysha Olson, daughter of Matt and Emily Olson; and 2nd Attendant Emily Bills, daughter of Brady and Dustylynn Bills and Sherland and Ashley Talbot. Other special awards given out that night were top interview to Shae Rawlinson, top talent to Swazey Bills and Miss Congeniality to Kenlee Sorensen. The night was emceed by Luke Kelso of Mt. Pleasant and the current Miss Fairview Malia Ah Kuoi. Little Miss Fairview royalty for ages 7-8 (L-R): 1st Attendant Kenlee Sorensen, Queen Swazey Bills, and 2nd Attendant Jacey Gleave. 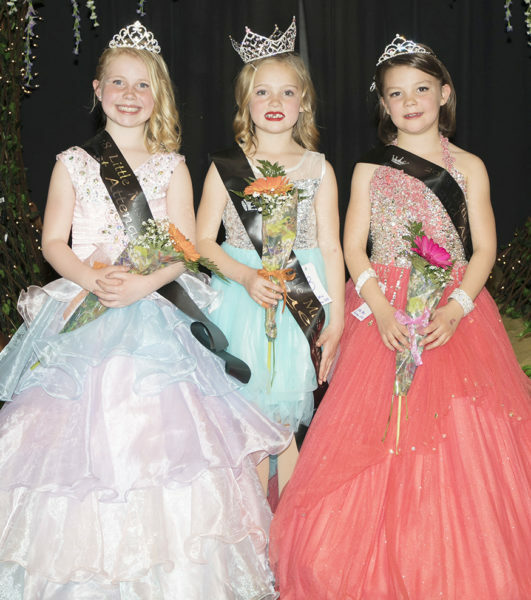 Little Miss Fairview royalty for ages 4-6 (L-R): 2nd attendant Penelope Cox, Queen Zana Lucas and 1st Attendant Kali Madsen. Marcy also said this pageant was started eight years ago to help build the self-confidence of girls in Fairview and to help encourage them to try out for Miss Fairview when they were of age. The pageant committee said they have watched several girls go from barely daring to peek their heads through the curtains to being in royalties, on cheer teams and so much more. These days, where many people access all the information they need from their phone or computer, it’s important for all businesses, no matter their size, to have what’s known as a strong online presence. That means when someone Googles the service or the product(s) you offer, your website is at the top of the page. Then, once they click on that link, it’s important it goes to a professional website that is optimally designed to showcase your business. Along with a great website, it’s also important to be prominently featured on popular social media sites like Facebook, Twitter and Instagram. Making all that happen can all be overwhelming to the small business owner who is concerned with the hundreds of details involved in running your own business. That’s where Anna Davis of Glacier Media Marketing comes in. Anna, who has an MBA from Westminster College, has more than 15 years of helping companies market and grow their businesses. Her clients used to be large international companies like Walmart, but Anna got tired of the rat race and moved to the area last year to leave that all behind. “I should have made the move a heck of a lot sooner,” she says with a laugh. However, Salt Lake City’s loss is Sanpete County’s gain. Anna has the skills you need to make sure your business comes out on top every time, and she can do so without charging you an arm and a leg. 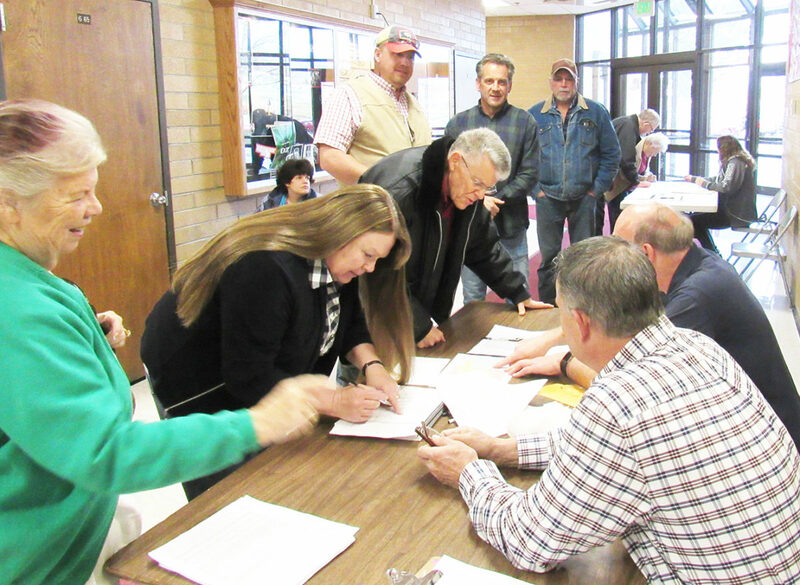 While many people in Sanpete still use the newspaper, word-of-mouth or even the phone book to find those who will provide the services they need, many others, particularly those who are new to the area, have trouble connecting with those people. They are used to looking those service providers up online and checking out their websites to find out more information. One mistake Anna says a lot of small businesses make is thinking any kind of website or social media page will do so they hire the high school kid down the street to design them a website or get them up on Facebook. Then they’re surprised when nothing happens. “There’s a lot that’s involved in putting together the right marketing plan, but it doesn’t have to be expensive if you have the right people,” Anna says. Anna and her team are those people. They will sit down with you and analyze your needs, then put together a plan which can range from designing flyers and door hangers to fully utilizing the benefits of the Web to get you the results you’re looking for. Once they’ve spent that initial time with you, it’s not going to take a lot of your time and most of it can be done remotely and at your convenience. Anna and her team members work out of their homes and are very comfortable working with you after hours if that’s what you need. You also don’t need to worry about being shuffled among a bunch of marketing or tech geeks either. Anna will always be your point of contact and, if she is not immediately available, will get back to you within 24 hours. Whether you’re tech savvy and know all about things like Pay Per Click and Search Engine Optimization or don’t have the first clue and just want someone who can use 21st century technology to help your business stand out among the competition and reach a lot more potential customers, Anna and her team can make that happen. So if you’re a small business owner or manger, give Anna a call at 435-604-5760 and find out all she can do to help your business succeed. You’ll be glad you did. The new Miss Lamb Day Royalty, crowned on Saturday, March 17, at Fountain Green Elementary School are (L-R) Attendant Ann Oldroyd, Miss Lamb Day Denisha Ivory and Attendant Sarah Oldroyd. FOUNTAIN GREEN—Denisha Ivory was crowned Miss Lamb Day last Saturday in Fountain Green. Denisha was second attendant in the Miss Lamb Day Pageant last year, but she won the judges’ hearts and the crown this year on Saturday, March 17, at Fountain Green Elementary School. She was also named Most Photogenic and Miss Congeniality. In addition to the crown, she earned a $1,500 cash scholarship. Named as attendants were Sarah Oldroyd and Ann Oldroyd. Sarah Oldroyd, the daughter of Ron and Holly Oldroyd, performed a piano solo: “Solfeggietto in C minor” by Carl Philipp Emanuel Bach. Sarah’s platform was Ready Encourage Accelerate Dream (R.E.A.D.). Ann Oldroyd, daughter of Darrell and Collette Oldroyd and the late Calli Oldroyd, performed a contemporary dance to “Glory and Gore” by Lorde. Her platform was “You’ve Got It in You!”—a focus on community blood drives. Both attendants won $750 cash scholarships. 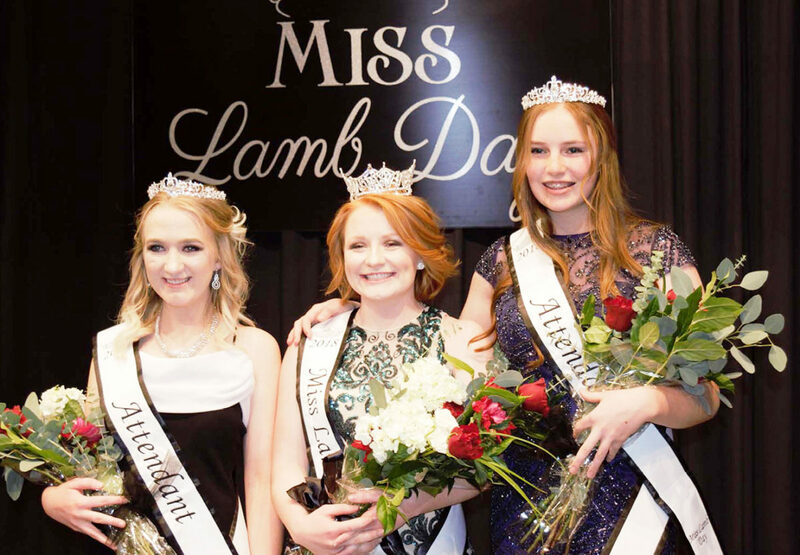 The new Lamb Day royalty will be reigning over the Lamb Day festivities on July 13 and 14 in Fountain Green. The 2017 Lamb Day Queen Melanie Beck danced a self-choreographed piece to “Empress”, Miss Moroni 2017 Heather Anderson performed a beautiful piano piece titled “Moonlight Fantasy”, Miss Nephi 2018 sang a rousing rendition of “Never Enough” from the movie The Greatest Showman, and the 2017 Miss Lamb Day First Attendant, Olivia Hanson, danced a fun jazz solo to “Kitchen”. J.Wade Beck was honored for the 34 years of service he has given to the Miss Lamb Day pageant, and Teresa Larsen received the annual Lamb Day Legacy Award. 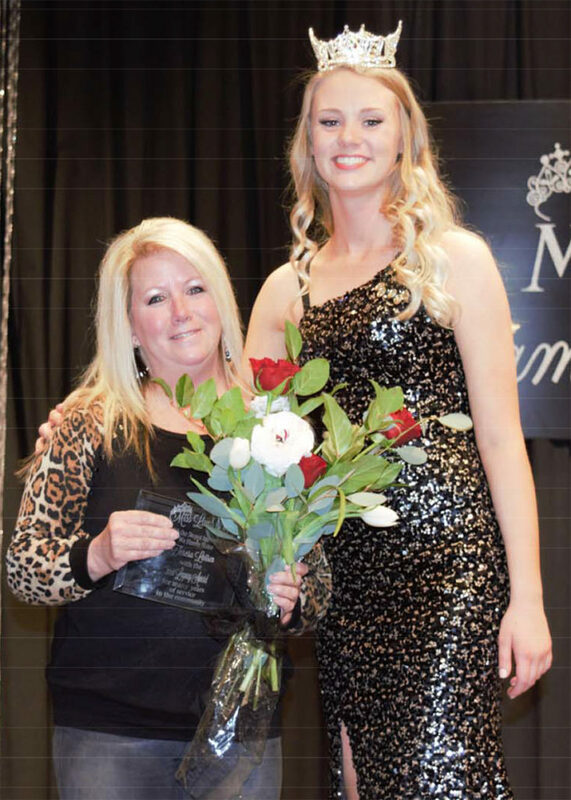 Teresa Larsen (left) received the Lamb Day Legacy Award from Miss Lamb Day 2017 Melanie Beck at the annual Miss Lamb Day Pageant last Saturday. The tribute said Larsen has served as pageant mom, certified Miss Utah judge, hair stylist, make-up artist, float designer and mentor. She has taught participants the importance of eye contact, stage presence and confidence. And she volunteers at Lamb Day by working the concession stands, coke trailer, talent show, lamb day program and helped with coordinating events. Full of talents, Larsen has been a cheerleader, clogger, dancer, singer and a professional clown (named Donuts) with her dad and brothers. And “she continues to develop new talents, including her ability to paint,” taking after her mother, Janet Ruth Covert, a professional artist. Larsen was raised in West Valley City, the youngest of two brothers, two stepbrothers and a stepsister.